Paul was born in 1908 to a prominent German family in Rochester. BS in Chemical Engineering from Massachusetts Institute of Technology in 1930. University of Rochester: Fellow in Chemistry and Experimental Pathology (1932-36), Assistant in Pathology (1936-37). PhD in Biochemistry in 1936 . 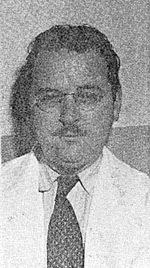 Instructor in Chemistry and Experimental Pathology in 1937, Associate in Chemistry and Experimental Pathology from 1940-1943 at Rochester. He worked with George Whipple (Noble prize 1934). Paul was the first to use Fe-59 to study iron requirements in anemic dogs, and in human pregnancy. Paul came to Vanderbilt in 1943, where he extended his Fe-59 investigations of nutritional requirements of pregnant women. Hahn worked in Biochemistry at Vanderbilt through 1947 with support from the Nutrition Program (with Bill Darby, Chair of Biochemistry). Hahn mentored Meneely at University of Rochester, and at Vanderbilt, they collaborated on many projects during the years 20 years they worked in Nashville. Paul moved his primary affiliation to Meharry Medical College about the time Meneely moved the Vanderbilt radioisotope program to the Nashville VA. Paul continued as a Consultant to the Vanderbilt program at the VA. One project involved the development, testing, and imaging of radioactive colloids in cancer therapy. Bill Meacham, Chair of Neurosurgery at Vanderbilt, worked with Hahn and Heyssel in the late 50s and early 60s in an attempt to treat hydrocephalus in children by injecting colloidal Au-198 into the lateral ventricles to decrease the secretion of cerebrospinal fluid (CSF) from the choroid plexus. In 1960, Paul moved to Bethesda, MD where he joined the National Institutes of Health as the Head of the Division of Radiological Health, Radiation Effects Study Section. It is likely that he died there around 1967, but his obituary has not been found. HAHN, P.F. (1946). “A simple method of preparation of colloidal ferrous iron for intravenous administration,” J Biol Chem. 163, 435. HAHN, P.F., BALE, W.F. and WHIPPLE, G.H. (1946). “Effects of inflammation (turpentine abscess) on iron absorption,” Proc Soc Exp Biol Med. 61, 405. HAHN, P.F. and SHEPPARD, C.W. (1946). “Selective radiation obtained by the intravenous administration of colloidal radioactive isotopes in diseases of the lymphoid system,” South Med J. 39, 558-62. HAHN, P.F. and SHEPPARD, C.W. (1946). “The selective radiation of specific tissues and viscera by means of radioactive isotopes,” Fed Proc. 5, 222. SHEPPARD, C.W. and HAHN, P.F. (1946). “Studies by radioactive methods of the distribution, retention, and excretion of colloidal particles administered intravenously in humans,” Fed Proc. 5, 227. SHEPPARD, C.W. and HAHN, P.F. (1946). “Retention and excretion of manganese dioxide dispersions administered intravenously to humans,” South Med J. 39, 562-5. SHEPPARD, C.W. and HAHN, P.F. (1947). “The use of colloidal radioactive gold in medical therapy,” Fed Proc. 6, 399. HAHN, P.F. (1948). “Tumor therapy by the direct infiltration of radioactive colloidal metallic gold,” Fed Proc. 7, 271. HAHN, P.F. (1948). “Treatment of neoplasms by the direct infiltration of radioactive colloidal metallic gold,” Am J Med. 4, 458. HAHN, P.F. and SHEPPARD, C.W. (1948). “The therapeutic use of radioactive elements in malignancy,” Ann Intern Med. 28, 598-606. GAMMILL, J.C., WHEELER, B., CAROTHERS, E.L. and HAHN, P.F. (1950). “Distribution of radioactive silver colloids in tissues of rodents following injection by various routes,” Proc Soc Exp Biol Med. 74, 691-5. GOLDIE, H. and HAHN, P.F. (1950). “Distribution and effect of colloidal radioactive gold in peritoneal fluid containing free sarcoma 37 cells,” Proc Soc Exp Biol Med. 74, 638-42. GOLDIE, H. and HAHN, P.F. (1950). “Effects of radioactive iodine on free sarcoma 37 cells in the peritoneal fluid of the mouse,” Proc Soc Exp Biol Med. 74, 634-8. HAHN, P.F. and CAROTHERS, E.L. (1950). “Use of radioactive colloidal metallic gold in the treatment of malignancies,” Nucleonics. 6, 54-62, illust. HAHN, P.F., HAAS, V.H. and WILCOX, A. (1950). “Arrest of development of plasmodium gallinaceum in mosquitoes (aedes aegypti) by radiation effect of p32 1,2,” Science. 111, 657. GOLDIE, H., CALVIN, L.B., NASH, H. and HAHN, P.F. (1951). “Radioactive colloidal gold in macrophages and serous exudate in peritoneal fluid of sarcoma bearing mouse,” Proc Soc Exp Biol Med. 76, 480-4. GOLDIE, H., TARLETON, G.J., JR. and HAHN, P.F. (1951). “Effect of pretreatment with cysteine on survival of mice exposed to external and internal irradiation,” Proc Soc Exp Biol Med. 77, 790-4. GOLDIE, H., WATKINS, F.B., POWELL, C. and HAHN, P.F. (1951). “Factors influencing effect of radioactive colloidal gold on free tumor cells in peritoneal fluid,” Proc Soc Exp Biol Med. 76, 477-80. HAHN, P.F. and CAROTHERS, E.L. (1951). “Radioactive metallic gold colloids coated with silver and their distribution in the lung and its lymphatics following intra-pulmonary administration; therapeutic implications in primary lung and bronchiogenic tumors,” Br J Cancer. 5, 400-4. HAHN, P.F., CAROTHERS, E.L., DARBY, W.J., MARTIN, M., SHEPPARD, C.W., CANNON, R.O., BEAM, A.S., DENSEN, P.M., PETERSON, J.C. and MC, C.G. (1951). “Iron metabolism in human pregnancy as studied with radioactive isotope, fe59,” Am J Obstet Gynecol. 61, 477-86. HAHN, P.F., JACKSON, M.A. and GOLDIE, H. (1951). “Liver cirrhosis with ascites, induced in dogs by chronic massive hepatic irradiation with radioactive colloidal gold,” Science. 114, 303-5. HAHN, P.F., SKIPPER, H.E., CAROTHERS, E.L. and BERNARD, L.J. (1951). “The effect of radioactive colloidal metallic gold in the treatment of “acute” ak-4 leukemia in mice,” Cancer. 4, 634-6. SHEPPARD, C.W., JORDAN, G. and HAHN, P.F. (1951). “Disappearance of isotopically labeled gold colloids from the circulation of the dog,” Am J Physiol. 164, 345-50. WHEELER, B., JACKSON, M.A. and HAHN, P.F. (1951). “Hematology of the dog following intravenous administration of radioactive colloidal gold,” Am J Physiol. 166, 323-7. GOLDIE, H., JEFFRIES, B.R., MAXWELL, M.C. and HAHN, P.F. (1952). “Growth of free tumor cells in the pleural exudate and their implantation into the pleura of the mouse,” Cancer Res. 12, 422-5. GOLDIE, H., WATKINS, F.B., POWELL, C. and HAHN, P.F. (1952). “Effect of colloidal au 198 on the growth cycle of leukemic cells and on the survival of their host,” Cancer Res. 12, 92-9. HAHN, P.F., ROUSER, G., BRUMMITT, H., MOOREHEAD, J. and CAROTHERS, E.L. (1952). “The drainage of radioactive silver colloids by the lymphatics following intrapulmonary administration in dogs,” J Lab Clin Med. 39, 624-8. WEST, H.D., HAHN, P.F., CLARK, W.F. and CHAPPELLE, E.W. (1952). “Labeled iron stores in study of iron liberated during red cell destruction by acetylphenylhydrazine,” Am J Physiol. 169, 194-7. GOLDIE, H., BUTLER, C.H., ANDERSON, M.M., MAXWELL, M.C. and HAHN, P.F. (1953). “Growth characteristics of free c1498 granulocytic leukemia tumor cells in the peritoneal fluid and the blood of c57 mice,” Cancer Res. 13, 125-9. GOLDIE, H., TARLETON, G.J., JR., JEFFRIES, B.R. and HAHN, P.F. (1953). “Effect of repeated doses of external and internal irradiation on structure of the spleen,” Proc Soc Exp Biol Med. 82, 395-9. HAHN, P.F. and CAROTHERS, E.L. (1953). “Lymphatic drainage following intrabronchial instillation of silver-coated radioactive gold colloids in therapeutic quantities,” J Thorac Surg. 25, 265-79. HAHN, P.F., CAROTHERS, E.L. and BRUMMIT, H. (1953). “Synergistic effect of internal irradiation and phlebotomy on production of cirrhosis and ascites in dogs,” Am J Physiol. 175, 162-6. HAHN, P.F., HILLIARD, G.W. and CAROTHERS, E.L. (1953). “The tolerance in humans of intrabronchially administered radioactive silver-coated gold colloids,” Br J Radiol. 26, 595-8. JACKSON, A.H., STAGGERS, F.E. and HAHN, P.F. (1953). “The uptake of subcutaneous and intramuscular silver-coated radioactive gold colloids by lymph nodes in dogs,” J Lab Clin Med. 42, 739-45. MENEELY, G.R., AUERBACH, S.H., WOODCOCK, C.C., KORY, R.C. and HAHN, P.F. (1953). “Transbronchial instillation of radioactive gold colloid in the lung of the dog, distribution studies, survival and pathology,” Am J Med Sci. 225, 172-7. WEST, H.D., CHAPPELLE, E.W., CLARK, W.F. and HAHN, P.F. (1953). “Hemoglobin as a tracer antigen in anaphylaxis,” Am J Pathol. 29, 363-8. CLOUET, D.H., BALL, C.O., MENEELY, G.R. and HAHN, P.F. (1954). “Electrophoresis of plasma proteins and ascitic fluid of dogs with radiation cirrhosis,” Proc Soc Exp Biol Med. 87, 362-5. JACKSON, A.H. and HAHN, P.F. (1955). “Effects in dogs of large doses of intraperitoneally administered radioactive colloidal gold (au198),” Cancer. 8, 482-7. MC, C.C., JR., CAROTHERS, E.L. and HAHN, P.F. (1955). “Distribution and pathology resulting from the intracerebral and intraventricular injection of radioactive gold and silver coated radiogold colloids,” Am J Roentgenol Radium Ther Nucl Med. 73, 81-7. HAHN, P.F., JACKSON, A.H., STAGGERS, F.E., JACKSON, M.A. and CAROTHERS, E.L. (1956). “Acute radiation death of dogs receiving a single massive dose of intravenous radioactive gold,” Am J Roentgenol Radium Ther Nucl Med. 75, 1139-43. HAHN, P.F. (1957). “Applications of radioactive colloidal materials in medicine,” Am Pract Dig Treat. 8, 568-71. HAHN, P.F., CAROTHERS, E.L., JACKSON, A.H., STAGGERS, F.E. and JACKSON, M.A. (1957). “Influence of age, dosage and survival on effects of multiple intravenous injections of radioactive gold colloids in dogs,” Am J Roentgenol Radium Ther Nucl Med. 77, 476-85. MATUSKA, R.A., HAHN, P.F., CARLSON, R.I., AUERBACH, S.H. and MENEELY, G.R. (1957). “Further observations on the lymphatic pick-up of radioactive silver-coated gold colloid administered intrathoracically to dogs,” Surg Forum. 7, 456-8. HAHN, P.F., HOLT, W.S., JR., DANLEY, D.A. and MOOTRY, P.J. (1958). “Effects of protein deficiency and massive internal irradiation of the reticuloendothelial system on antibody reactions in kidney homotransplantation,” Ann N Y Acad Sci. 73, 745-52. HAHN, P.F., LAREAU, D.G., FEASTER, B.L., CAROTHERS, E.L., GOLLAN, F., MENEELY, G.R. and SHERMAN, D. (1958). “Intravenous radioactive gold in the treatment of chronic leukemia; comparison of results with conventional roentgen therapy to the splenic area,” Acta radiol. 50, 565-72. HAHN, P.F., MENEELY, G.R. and CAROTHERS, E.L. (1958). “The use of gold and silver-coated radioactive gold colloids in the palliation of ascites and pleural effusions,” Br J Radiol. 31, 240-5. HAHN, P.F. and MENG, H.C. (1958). “Internal irradiation of dogs with radioactive colloidal gold: Synergistic effect of iron,” Cancer. 11, 591-6. HAHN, P.F., GLEASON, G.I., SHERMAN, D. and FRAZIER, H.M. (1959). “Hepatic radiography following intravenous administration of colloidal gold under experimental conditions,” Br J Radiol. 32, 609-11. HAHN, P.F. (1960). “The adjuvant therapy of bronchogenic carcinoma following pneumonectomy or lobectomy with the intrathoracic introduction of silver-coated radioactive colloidal gold,” Nucl Med (Stuttg). 1, 230-7. HAHN, P.F. (1960). “Panel on recent developments in cancer therapy advances in radiation isotope therapy,” Acta Unio Int Contra Cancrum. 16, 1269-73. HAHN, P.F., MENEELY, G.R., CARLSON, R.I. and ALSOBROOK, W. (1960). “Adjuvant use of silver-coated radioactive colloidal gold in treatment of bronchogenic carcinoma by pneumonectomy,” J Nucl Med. 1, 273-9. HAHN, P.F. and CAROTHERS, E.L. (1962). “Synergism of experimental hemolytic anemia and radioactive gold in ascites development,” Acta radiol. 58, 176-85. HAHN, P.F. and CAROTHERS, E.L. (1963). “Long term studies in dogs receiving single massive injections of radioactive iron during growth,” Acta Radiol Ther Phys Biol. 1, 423-32. HAHN, P.F., CARLSON, R.I., ALSOBROOK, W.L. and MENEELY, G.R. (1964). “Five-year survivals following the use of silver-coated radioactive gold colloid as an adjuvant to pneumonectomy in the treatment of bronchogenic carcinoma,” Br J Radiol. 37, 233-5. HAHN, P.F. and CROMROY, H.L. (1964). “Letters to the editor,” Science. 143, 994. HAHN, P.F. (1967). “Production and use of silver-coated radioactive gold colloids,” Int J Appl Radiat Isot. 18, 177-81.